Home / -Vintage Video- / Four Seasons / Frankie Valli / Vintage Video / Vintage Vinyl: The Four Seasons Top Pop and R&B Charts With "Big Girls Don't Cry"
Vintage Vinyl: The Four Seasons Top Pop and R&B Charts With "Big Girls Don't Cry"
Frankie Valli & the Four Seasons may have seemed like an overnight success when they took their first three Vee-Jay releases to the top of the U.S. charts but Valli had been trying to get a hit since the mid-50's. 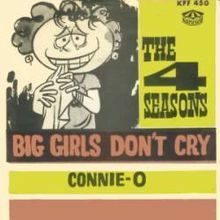 Finally, in 1962, all the work came to fruition when "Sherry" went to number 1 for five weeks starting on September 15 and, just two months later, they did it again with "Big Girls Don't Cry". Written by Bob Crewe and Bob Gaudio, "Big Girls Don't Cry", the song not only topped the Hot 100 for five weeks, it also hit number 1 on the R&B Singles on the same day, November 17, 1962. For the Four Seasons, they became the first act of the rock era to hit number 1 with their first two chart entries. The Four Seasons would go on to have six number 1 records through 1975 and Valli would do it again in 1977 with the theme song from Grease.